Playing with Papercrafting: Smile for Dynamic Duos! 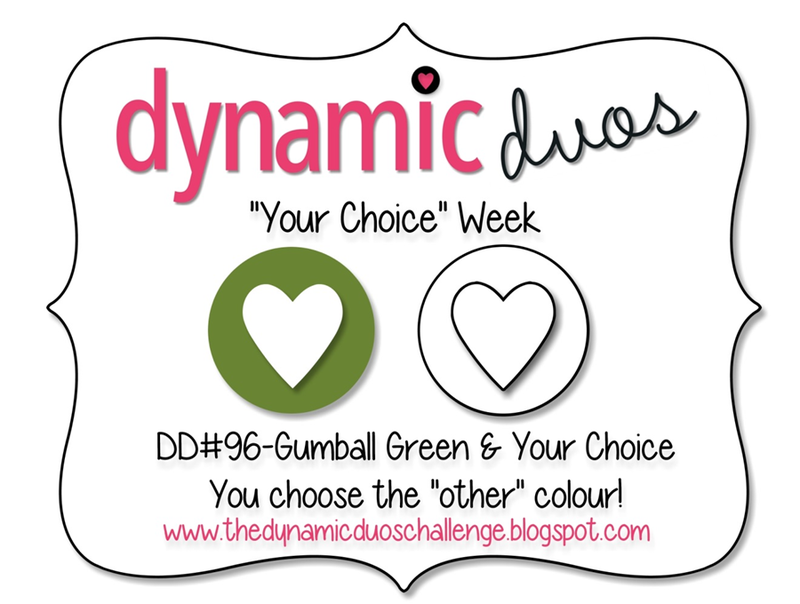 Dynamic Duos always manages to challenge me with colours I don't normally use and, except for Christmas, I don't use Gumball Green very often. I had to smile because the Design Team chose Gumball Green (Does anyone else always end up typing "Bumball Green"?) for this week's challenge, but thankfully let us pick the second half of the Duo. I checked the Colour Coach, which is normally very useful, but the colour trios suggested were all way too much for me. Then, as I perused my stock of DSP, Modern Medley caught my eye! Yes! Black and Gumball Green would work perfectly, and Very Vanilla as a neutral, because it's the background colour in all the Modern Medley designs. Here's how it turned out, and it made me Smile! I love the bold font and the awesome medallion in the Happy Day Stamp Set! It was perfect for this challenge because it takes up the empty space on the card, but it's so simple and clean-looking. I used up lots of Modern Medley scraps for the banners. I die cut them using the two smallest Banners Framelits. I added them to the front panel before adhering it to the card base. Here's why. The large flags were all the same length, as were the small flags, but I wanted them different lengths. I wasn't sure how I wanted them arranged until I played with it a bit, so I didn't have any idea how much to cut off each one. Instead I arranged them until I was satisfied with how it looked, then I adhered them to the panel and trimmed the ends even with the edge of the panel. Easy peasy! I'm so glad I challenged myself with this colour. Next up: Rich Razzleberry or Rose Red! Labels: all occasion card , DD #96 , Gumball Green , Happy Day stamp set , Heather Cooper , Modern Medley DSP , Stampin' Up! Your choice of neutrals really makes that BUMball green pop! Great graphic card. Thanks for the chuckle and for linking up with the Dynamic Duos this week.